Cool blue rays radiated through odd shaped icebergs as they drifted aimlessly throughout LeConte Bay in Southeast Alaska. As our outboard powered inflatable boat approached the massive iceberg flotilla, each iceberg or “Bergy Bit” had their own unique, one-of-a-kind personality. Some chunks of blue ice looked like giant birds while others looked like sea monsters or ice ships piloted by blue ghosts. Imaginations run wild at LeConte Bay, the most southern tidewater glacier along the Pacific Coast. In 1887 John Muir asked Charles Thomas, U.S. Navy Lieutenant-Commander, to name LeConte Glacier in honor of Muir’s friend, Joseph LeConte, a noted California geologist at the University of California at Berkeley. LeConte Glacier provides a unique habitat for harbor seals in the area. These big eyed, baby-faced seals sun themselves on icebergs and use the bay as a breeding, birthing and rearing area. Sometimes dozens of seals can be seen atop these blue icebergs trying to warm themselves on the ice – one of Alaska nature’s unique juxtapositions. In 1995 LeConte Glacier retreated half a mile in just five months. In 1998 LeConte Glacier retreated nearly one mile farther, making LeConte Glacier one of the fastest retreating glaciers in the world. Kevin, our guide from Innersea Discoveries Cruises piloted the inflatable through the iceberg maze, and aimed toward a massive blue ice curtain with backlit caves. As we approached the curtain of blue ice the sound of bacon frying echoed around the boat. Constant pressure on glaciers causes them to slip and slide their way downhill grinding granite into flour which turns the bay into a combination of emerald and ivory color. LeConte Glacier calves spectacularly into saltwater leaving just 10 percent of the icebergs or less above water. Some of the icebergs run aground on sand bars created by glacial silt. Chunks of blue ice calve off the icebergs as they melt. 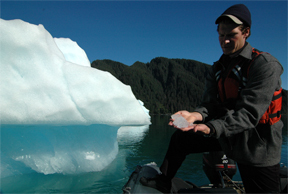 These smaller chunks are commonly called “Bergy Bits” and float around like giant ice cubes in punch bowl. Cruises aboard Innersea Discoveries are affordable and start at $1,795 per person for a 7-day cruise. This price includes kayak trips, hiking, skiff tours, meals, soft drinks, and knowledgeable guides. If you have ever wanted a more adventurous Alaska vacation, this cruise company will fit the bill and put you so close to Alaska you can touch it, smell it, taste it, hear it and surround yourself in wilderness Alaska.